In the last month, oceanic and atmospheric indicators of the El Niño-Southern Oscillation (ENSO) have pushed forecasts back towards an increased likelihood of a La Niña event this winter (Figs. 1-2). Models are indicating an increased possibility of these conditions sustaining through winter 2017, leading to greater certainty regarding the formation of a weak La Niña event in late 2016 or early 2017. 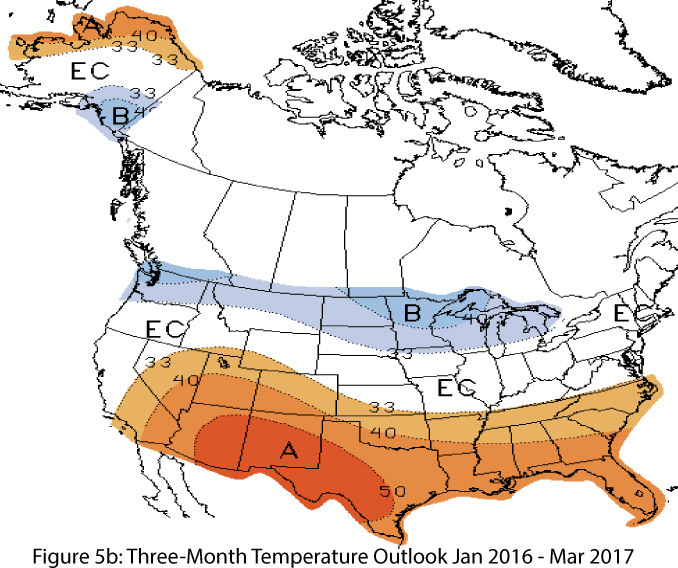 However, the chance of an ENSO-neutral winter cannot be entirely ruled out. Fluctuations in forecasts and models are likely due to the limited coordination between oceanic and atmospheric conditions described in previous outlooks, as well as generally borderline conditions between weak La Niña and ENSO-neutral. A closer look at the various forecasts and seasonal outlooks provides insight into the range of expectations for this La Niña event. On October 11, the Japanese Meteorological Agency identified La Niña conditions in the equatorial Pacific, and projected a 60-percent chance that they would remain through winter 2017, down from 70 percent in September. 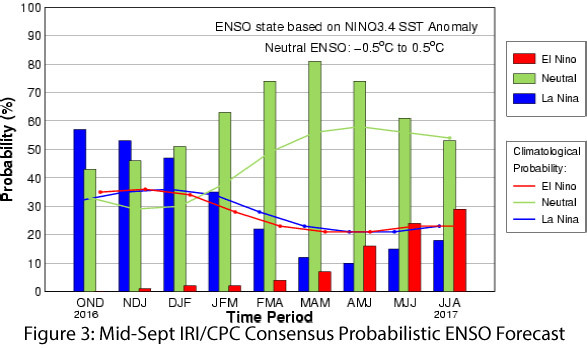 Also on October 11, the Australian Bureau of Meteorology maintained its La Niña watch with a 50-percent chance of La Niña forming this winter, identifying numerous indicators that had shifted towards more La Niña-favorable conditions but noting that some uncertainty would remain until there was greater consensus in the models. On Oct 13, the NOAA Climate Prediction Center (CPC) pivoted to a more bullish La Niña forecast, with a 70-percent chance of La Niña developing in 2016 and a 55-percent chance of this event persisting through winter 2016-2017. On Oct 20, the International Research Institute for Climate and Society (IRI) and CPC forecasts described borderline weak La Niña conditions as present, but that may not even last through 2016, given poor atmospheric coupling and a general lack of trade winds typically seen in La Niña events. 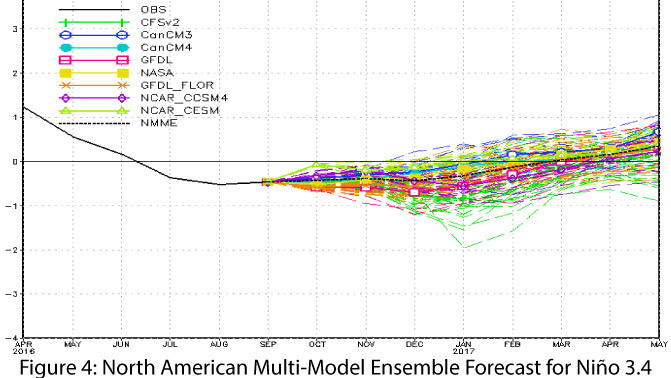 The North American multi-model ensemble characterizes the current model spread and highlights the variability looking forward to 2017. 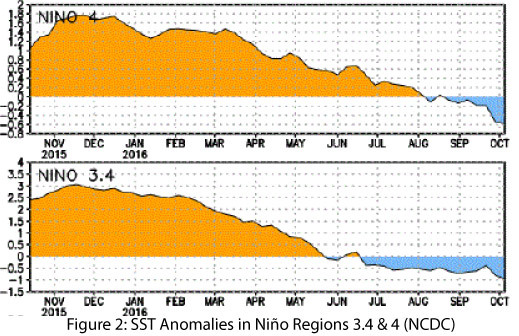 In the current run, the ensemble mean hovers around weak La Niña through 2016 before returning to neutral conditions in early 2017 (Fig. 4), whereas last month it showed a more rapid rebound to neutral conditions in 2016. 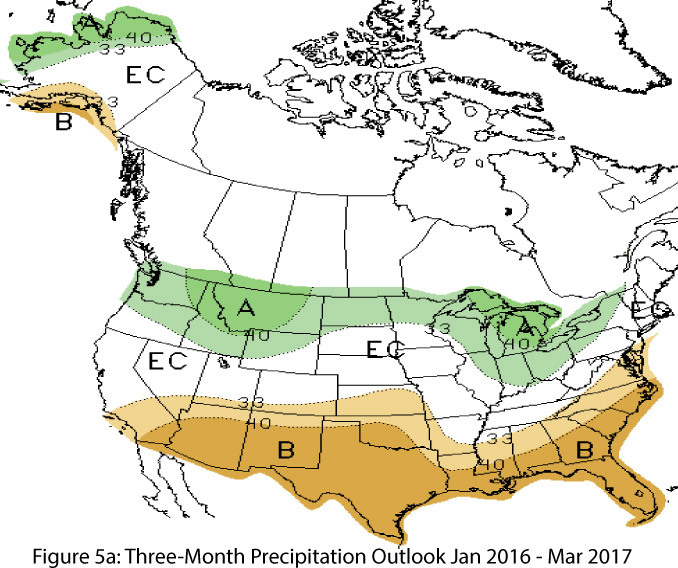 Collectively, these forecasts suggest that the Southwest is more likely than not to experience a weak La Niña event during winter 2016-2017, which could bring warmer- and drier-than-average conditions to the region over the cool season. The caveat is that most models show a relatively rapid decline in La Niña conditions by early 2017, which could mean a return of ENSO-neutral conditions before the peak of cool season precipitation in the Southwest (January-March), which might limit the La Niña influence on precipitation (Figs. 5a-b). On the other hand, even if the event wobbles back towards neutral, the oceanic and atmospheric conditions could still exert some influence on seasonal weather patterns. This uncertainty is difficult to plan around, but Southwestern winters are already characterized by a relatively dry climate (i.e. limited precipitation events over the cool season), and a La Niña event generally has the potential to shift that seasonal pattern to an even drier state (Fig. 6). 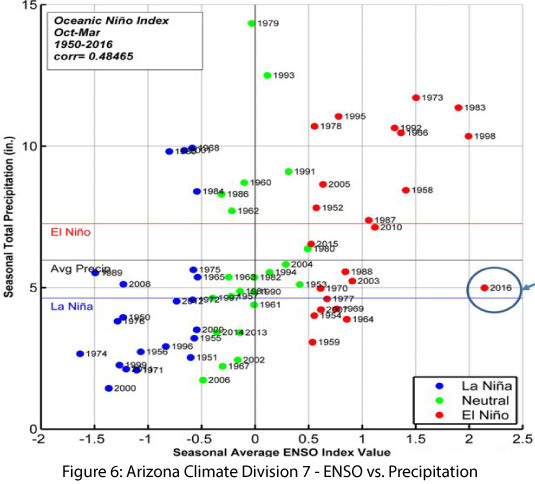 There is greater variability in precipitation totals during ENSO-neutral years, making it harder to predict winter precipitation totals, but in general a wetter than average winter is unlikely if La Niña conditions persist.